A New Canaan resident has lodged a complaint with the town regarding the proximity of parking spaces to crosswalks, municipal officials say, so they’re turning to a Fairfield-based traffic engineering firm to figure out whether a change is required. 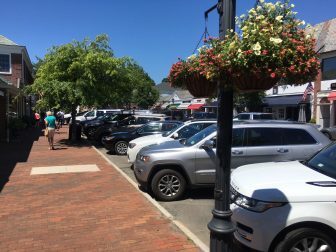 Specifically, the complainant cited “safety concerns” regarding parking spaces along the one-way stretch of Elm Street, according to New Canaan Public Works Director Tiger Mann. 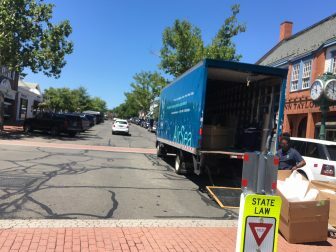 That stretch includes five crosswalks, and under state law, no car may park within 25 feet of a crosswalk, meaning that a change would appear to require New Canaan to eliminate spaces in the most desirable area of its downtown. “Given the fact that if we change the layout it would change the number of spaces, we decided that it was best to have a traffic engineer take a look at it and give his interpretation on what the layout should be given the state statute, the town’s statute and the town’s requirements as far as P&Z in terms of spacing, angle of parking, curb length,” Mann said. The town specifically will ask the engineering firm whether it can “co-locate,” meaning non-parked areas near the crosswalk would be used for handicapped parking, Mann said. It appears that the “25 feet” rule would reduce the number of spaces on Elm Street—for example, the area near the Moreno Clock would not allow for any parking at all, since two of those 25-foot “setbacks” would meet. One way to solve for the problem is to reduce the angle of the angled parking on the south side of Elm, yet as it is, vehicles backing out of those spaces must enter the far traffic lane in order to straighten out. The town has worked very hard in recent years to increase the available parking downtown and specifically on Main and Elm Streets, offering new types of permits to employees of businesses there to get them off of those streets so that shoppers and diners can use them. “Given the sensitivity” of what could follow from a change with respect to parking, “we are going to ask a professional to take a look,” Mann said. Two parking related comments: (1) I completely agree we should reduce the angle of Elm Street’s diagonal parking spaces. Those spaces actually used to be that way — easy to back out of, since you didn’t have to back into two lanes, just one. The Town increased the angle (maybe 10-15 years ago? ), and thus made parking there harder, not easier. (2) General comment: it seems the width of public parking spots in NC is the bare minimum, especially in the upper muni lot. Yes, we get a few more spaces perhaps, but we also get dinged doors, cars over the line, and cars packed so tightly together you can’t get out. If we ever get more parking, we should widen each space by 12 inches. These aren’t big problems, in the scheme of things, but could improve daily life here.